Time to dust of the old joystick; rejoin the Quake community and cash in on QuakeWorld! This November; prepare to make some money out of your 10k hours of duel practise! Duel tournament with prizes for BOTH the higher skilled and lower skilled duellers coming this November! 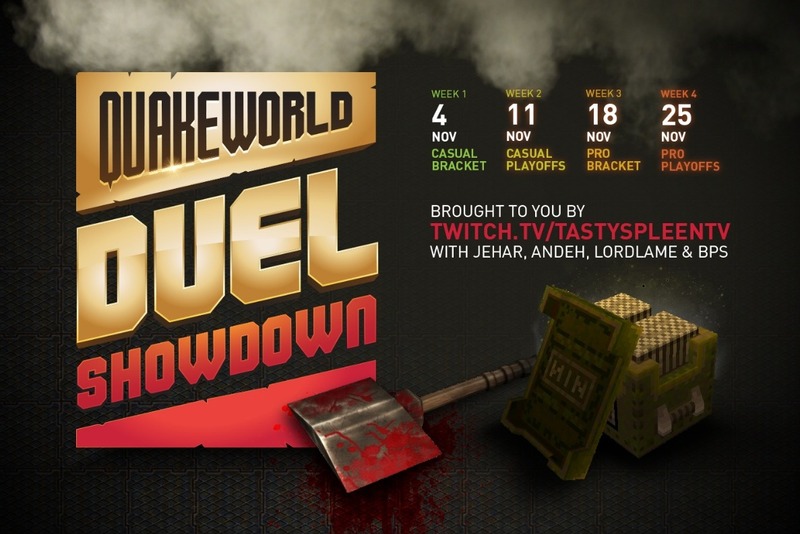 Lordlame and bps are running an epic duel tournament with long awaited cash prizes for QuakeWorld! Tasty Spleen TV with Jehar and Andeh! It's not to often we have prizes in QuakeWorld that involves more than fame - so this is quite refreshing indeed now that we can add 'and fortune' to that line! Notable signups already include famous players like: Locust, Speedball, Greco, Dev, and up-and-comers like Hammer to limit it to just naming five - though I could go on...! This should get quite interesting and intense: When sincerely competitive players play - not just for the fun of it - but to actually increase their bank balance! The registration is open - but will of course be closing at some point - so make sure to register straight away if you want the chance to compete ! Two divisions will be able to compete for the same amount of winnings! A 'Casual division and a 'Pro division. It will not matter if you similarly like me; casually can't tell the difference between the sounds of RA spawn or Ammo room spawn on DM4 - You will have the chance to walk away with the same amount of money as the div0 players are competing for! Both of the organizers are very good duellers themselves, so the seeding of the players will likely be quite perfect; and done to maximize fairness! They are also open to seeding appeals, should someone feel that a division placement mistake has been made. Clear out your calender! The schedule sees strict deadlines and walk-over rules with separated match dates. The casual division will be playing November 4 and 11. While the Pro division will be starting their games on November 18 ending on November 25. The map pool sees the inclusion of Skull, along with what is becoming a new standard duel map Bravado. The rest of the pool is, as we expect (and want to see) in a duel tournament: Dm2, Dm4, Dm6, Aerowalk and ZtnDm3! Primarily a European tournament - the ping rules sees a maximum of 52ms. Meaning no- European based player 'should ideally' have to ping higher than 52. Further rules can be found here: QuakeWorld Showdown 2018 rules. . Make sure to read it all. At the time of this post the total prize pool is at 460 euro ! The tournament is open for donations that goes directly to increase this total at this Gofundme page: GoFundMe QuakeWorldShowdown.. Do contribute! It's wonderful for our community and keeps QuakeWorld alive when we run fun events like this! Perhaps the most fun news for this tournament with Tasty Spleen TV's involvement and the separated division match dates - will we finally be seeing the casual players getting some screen time? Crossing my fingers ! Rules: QuakeWorld Showdown 2018 rules. Moved big banner to Full Article - a lot of lazy players ignore all news below this big picture.